You can smell it in the air in Seattle. That time of year when children, teenagers, and adults alike eagerly make their way back into the classroom to learn important information like “who won the war of 1812?” , what is x = 12-4(3) / 8(27+45) , can our culture successfully embrace transformational leadership in corporate America? Well, maybe not everyone is eager. However, there is always the possibility of getting to go back to class and having new and improved stuff to work with. Here is a great new product line to look for! 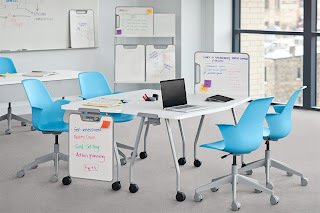 Steelcase has created a great new table product that has installed what every student over the past 20+ years has most likely doodled on…a mountable, mini whiteboard. Verb is great for collaborating during class and sharing ideas, this line of products (which includes tables) “is an integrated collection of furniture designed to support… learning spaces and project team rooms”. Find out more here! And for some fun, check out this great video from EM Strasbourg (France) taking complete advantage of the awesomeness that is the Node chair.